Here is a quick easy gift that you can still have done in time for Mother's Day, or for yourself! Do you have any fat quarters laying around? That is all you'll need. Here I have for you is a 16" x 16" quilted pillow case with a envelop back and a table runner that is 16" x 48". This pattern would look great either using solids like shown on the cover or even prints! The table runner is also a nice size to use as a wall hang in hall ways, bathrooms, or stairways for decorations. Colors used on the Pillow are Kona Cottons in Punch and White. Colors used on the Table Runner are Kona Cottons in Deep Rose, Salmon, and Melon with the rose flower in White. Batting - 18" x 18"
Backing for Quilted Top - 3 Fat Quarters for scrappy backing. Batting - 20" x 54"
With your print fat quarter subcut, 4 – 4 ½” x 8 ½” rectangles, 4 – 4 ½” x 2 ½” rectangles, and 12 – 2 ½” squares. 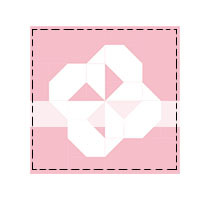 With background fat quarter subcut, 4 – 4 ½” squares, 4 – 4 ½” x 2 ½” rectangles and 4 – 2 ½” squares. Within each print fat quarter’s subcut, 4 – 4 ½” x 8 ½” rectangles, 4 – 4 ½” x 2 ½” rectangles, and 12 – 2 ½” squares. With background 1 fat quarter subcut, 12 – 4 ½” squares, 12 – 4 ½” x 2 ½” rectangles. With the second background fat quarter subcut, 12 – 2 ½” squares. 1. With your colored 4 ½” x 8 ½” rectangle and a background 2 ½” square. Place background square on the bottom right side, sew at a diagonal, trim ¼” away and press open. 2. With your background 4 ½” square and two colored 2 ½” squares. Place print 2 ½” squares on the top left and bottom right. Sew at a diagonal, trim ¼” away and press open. 3. With your background 4 ½” x 2 ½” rectangle and one colored 2 ½” square. Place square on the right side, sew at a diagonal, trim ¼” away and press open. 4. 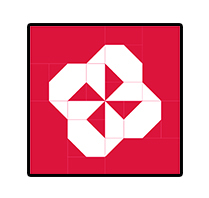 With the blocks made in steps 2 and 3, and a colored 4 ½” x 2 ½” rectangle form the block below. Sew the colored 4 ½” x 2 ½” rectangle to the left side of the block made in step 2, and block 3 to the right side of step 2 block. 5. Lastly with the block made in step 4, attach the block made in step 1 to the top. Repeat steps 1 -5 until you have made 4 blocks for one colored flower. 6. 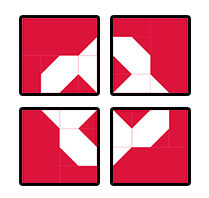 To form a flower block, take four blocks made in step 5 and rotate them 90 degrees. Sew blocks together to form rows, sew rows together to complete your flower block. Note: If you are making a Pillow, continue on to the Pillow Finishing Section. If you are making the table runner, make a total of 3 flower blocks and sew them side by side, then continue on to the Table Runner Finishing Section. 1. With your finished quilt pillow block, quilt it. Use 1 fat quarter and trim to 18” x 18” square for your backing and layer with batting to quilt it. Once finished Trim down to a 16” square block again. 3. Lastly adding right sides together first lay your quilted pillow front, folded sides will aim towards the center of the pillow. (It should over lay each other, this will be your envelop backing) Sew a ¼” seam ALL around your quilt pillow square. You may also use a serger or blanket style stitch all around to secure it more if it will be under heavy use. 4. Once finished flip it right side out and stuff with a 16” square pillow form. 2. First sew your blocks together to form to complete your top. 3. Finish your table Runner like a standard quilt. 4. Layer the backing, batting and table runner top to form a “sandwich” and baste together for machine quilting. 5. Trim Excess batting and backing fabric. 6. Lastly using 2 ½” x WOF binding strips, use your favorite technique to complete your table runner. Thank you so much for the pattern. I really like this rose design. I love making table runners... This is one of the simplest, but prettiest I have seen... you can be assured, I will be making it right. Thnx 4 the pattern. 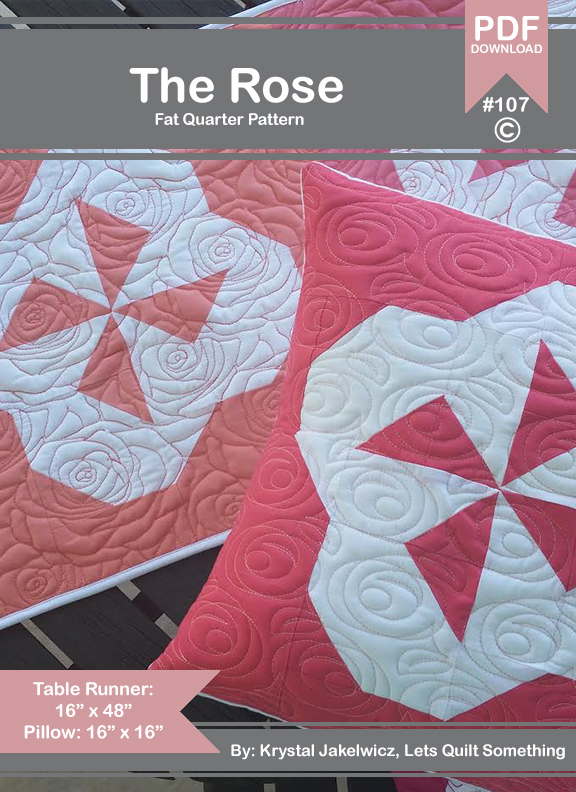 I like the continuous quilting designs used. Are they available as a pattern?